The International Monetary Fund (IMF) recently released a report regarding which nations will suffer the most loss resulting from China's slowing investment growth. According to the IMF, Australia will be the worst hit advanced economy, with only developing economies Iran, Kazakhstan, Saudi Arabia, Zambia, and Chile suffering a bigger loss. The basis for the IMF's study was in large part on data derived from the Australian Treasury, which also suggested that Australia's annual growth rate would be just 2.5 percent from 2020 onwards. That will make it difficult for the nation to return to a budget surplus in the next decade. This reflects a downward revision to predictions from a 10-year budget outlook that assumed the economy would grow 3.5 percent for five years after 2017-18. Some economists believe the numbers should be even lower than 2 percent. According to the Financial Review, the IMF's managing director Christine Lagarde has delivered a series of warnings in recent weeks to warn world economies to watch for potential shockwaves flowing out of China. Although Lagarde has not delivered details of the research or data forming the basis of her warnings, deputy-managing director Min Zhu told an audience in Dalian, China, that a near halving of investment growth in China (the second-biggest economy in the world) would occur over the next five years. This, in turn, would translate to an approximate one percent reduction in Australia's potential GDP growth over the same period. Estimates released by the Chinese government projecting that investment will decline from 46 percent of GDP to around 35 percent over the next five to 10 years are the basis for the IMF’s predictions. Chinese authorities expect investment growth to fall to 4.6 percent over the next five years, dropping from an average of 9.5 percent over the last five years. China is in the process of trying to shift its economy away from a reliance on exports to a more domestic-centric model of economic growth. 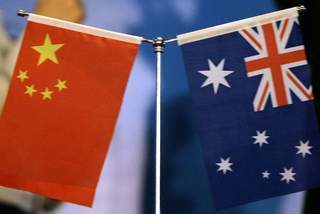 Projections by the IMF predict that for every percentage point decline in Chinese investment growth, Australia's potential GDP falls by 0.2 percent. If Chinese investment growth slows even faster, as some economists fear, the result for Australia could be correspondingly larger and more devastating. Alphabeta, a consultancy firm, has identified what it describes as the "lucky eight" sectors outside mining (the sector likely to be most affected by the Chinese economic slowdown) that it believes investors should focus on. These sectors include retail, agriculture, tourism, financial services, clean energy and environmental services, healthcare, advanced manufacturing, and education. On the other hand, on a national level, everyone seems to agree that Australia will have a difficult time tapping into China's new economic model, given its focus on domestic growth.